Huawei isn't exactly the first name you think of when it comes to high-end smartphone. In fact, it may be among the last. 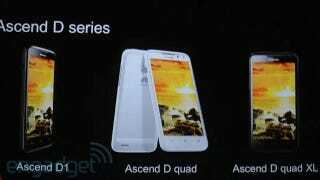 Its new 4.5-inch, Ice-Cream Sandwich running, quad-core with 16 core graphics processor and LTE may change that. Engadget was on-hand as the Ascend D made its debut at MWC in Barcelona just now. It's got a 4.5-inch 720p screen, giving it a pixel density of a very impressing 330ppi, which matches the iPhone 4S. It also has Dolby 5.1 Sound integrated into it. One might wonder what the hell you need 5.1 sound on a phone for. Good question. The smart money says that would be for beaming music and movies to your home entertainment center. Pretty cool. For all that, it's only 8.9 millimeters thick and it packs an 1800mAh battery, that is supposed to last "one to two days". We'll just see about that. The big story here, though, is the processor. It's one of the first quad-core smartphones to be officially announced (though we'll likely see more by day's end). This one uses Huawei's own chip, the K3, which is a quad-core A9 that has 16 GPU cores built-in. It will be clocked at makes-your-cheeks-flap-around 1.5GHz. According to Huawei, it benchmarks faster than Nvidia's Tegra 3, runs cooler, and offers up to a 50-percent reduction in power consumption. Them's some bold claims, and we'll have to wait until we can get our hands on one for some real testing.